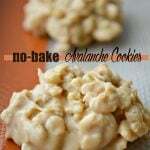 These no-bake Avalanche Cookies are so easy to make and are delicious! They only take 10 minutes to prepare and once they're done you'll want to eat them all up! Line a baking sheet with parchment paper or a silpat and set aside. Add your Honey Nut Cheerios and Rice Krispies to a large bowl and set aside. Break up your white chocolate into smaller chunks and place in a microwave bowl. Heat in 30 second increments making sure to remove and stir in-between. When your chocolate is all melted add your peanut butter and Biscoff and stir well. It should melt and mix well. If it's a bit thick you can put it in the microwave for an additional 15 seconds. Pour your chocolate mixture over your cereal and stir well. Scoop the mixture using a tablespoon and drop onto your lined baking sheet. Put in the fridge until the chocolate is cold and set. -- I think these are better if kept in the fridge. When it gets warm the chocolate and peanut butter gets a bit sticky.